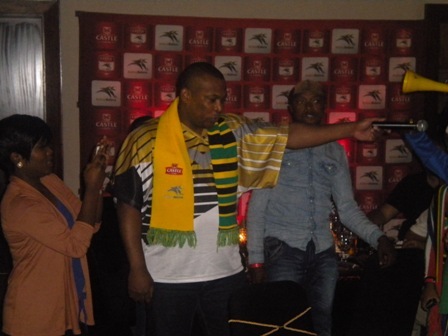 On Friday night I was the lucky guest of Castle Lager as we prepared for the AFCON in true Mzansi style. The event would be to salute the fact that Castle Lager and Bafana Bafana have formed a successful partnership for 20 years now. In those 20 years we have seen some exceptional highlights for the national team including Benni McCarthy breaking the national scoring record, Mbazo becoming the first 100 cap Bafana player, that Shabba goal, the rise of Radebe and of course the hosting and winning of the AFCON in 1996. And it was the last of those achievements that was the theme for the night, I mean, who best to inspire the class of 2013 than the brilliant squad of 1996. 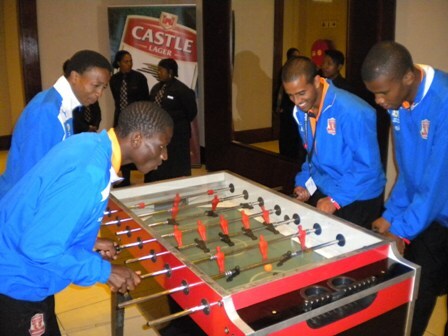 Arrival was a reminder of what the beautiful game is about as upon getting down to Monte Casino you were greeted with a host of foosball tables. The Castle Superstar XI were there to after what has been a very successful program run by Castle to un-earth the next Lucas Radebe or Siphiwe Tshabalala. Inside there were also a bunch of FIFA 13 games set up and a dinner set up that would not be out of place at any formal gathering. But when things really got started, thats when the excitement started. 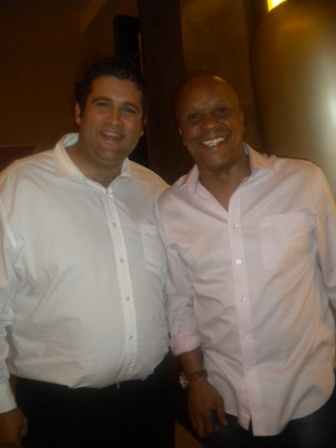 Robert Marawa hosted the show live on Metro and was joined on stage by Clive Barker, Neil Tovey, Mark Williams, John Tlale and Chippa Masinga. From the interchanges we were hearing the truly outstanding thing about the squad of 96 was the comraderie that they share with one another. Tovey was pointed out as being one of the greatest captains ever and will hopefully be an inspiration to Bongani Khumalo in the current year edition. Of course the banter was largely aimed at Mark Williams and John Tlale who, to their credit, took it brilliantly and added a humurous approach to the evening. In the second half of the segment Marawa walked to the other legends in the crowd and we heard from Mark Fish (who embarrassed Tlale), Roger de Sa, Linda Buthelezi, Edward Motale (Who was hilarious), Zane Moosa, Eric Tinkler and Daniel Mudau. 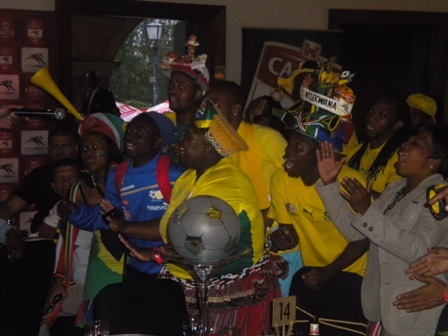 The legends were also more than happy to mingle with supporters and wish Bafana good luck for this years tournament. Castle Lager went out of their way to provide fans an opportunity to mingle with stars of the local game as well as to pick the moods up for the current tournament. Bafana, over to you now boys.